I always over-plan for our homeschool years. I’ve just accepted that I will probably do this every year and then slowly pare down to the curriculum I feel is necessary. The extras get dropped along the way as we settle into our semester. For reference here are links to all of my plans for the school year. We read books each day, do handwriting practice, complete Hands on Thinking Skills, and diligently work on All About Reading Pre-Level. We very slowly read through some science and history books but I’m sure we won’t get to all that I have planned. And art and music sadly get pushed aside. I decided not to use Phonics Road this year but instead save it for next year as it is a fairly intense program that requires a lot of writing. We are using All About Spelling (very slowly!) to build spelling skills and reinforce reading skills. I dropped Writing With Ease 1 for the year. I feel it’s better to focus on reading and learning to spell as well as basic handwriting. In short, I just felt that adding in writing was too much and that Bee was not ready for the challenge. It’s on the shelf for next year as well. I’m not sure that we will finish Right Start B in order to move on to C as we are moving very slowly through this program. I’m not using Apologia right now but only using the Nancy Larson Science. Adding in Apologia is too much right now. I think we will finish Nancy Larson early in our year so I think I will have time to add in Apologia in the spring. Music and art are often neglected. I’m not sure we will get to Beast Academy this school year. We are still working through Right Start C and focusing on subtraction and multiplication. I shelved Phonics Road 2 in order to have a more gentle focus on spelling with All About Spelling. We are still working on All About Reading 2. I’m hoping to begin Level 3 sometime in the spring. However, it might take the rest of this year to finish Level 2. I dropped Writing with Ease for Tiger as well. He was not ready for the challenging dictation of Level 2 as he cannot fluently read and his spelling skills are a little weak. I’ll save this for next year. Apologia is on the shelf for him as well. We might add it into our schedule later. And music and art don’t often make our schedule. Curly is still finishing up Math Mammoth 3 although I do hope to begin Level 4 sometime soon. The extra math practice is very helpful to reinforce the concepts she’s learned through Right Start. We have yet to begin Phonics Road and are instead working through All About Spelling Levels 1-3 as a gentle review. I think we will start Phonics Road 3 (the second half) later in the spring and continue it on through next school year. I’ve changed our Spanish plans completely and we now use Duolingo along with some Spanish flash cards for daily review. However, we will be able to complete Song School Latin 1 and 2 this school year. Also, Curly is moving ahead in her writing skills (her passion) so I think we will try to complete Narrative I and Narrative II from Classical Academic Press. I’m not sure we will get to Notgrass American History. But will instead begin the next year of Veritas Self-Paced history which will put us back in Egypt. Most of Curly’s science plans have been put aside. Right now she’s helping teach science to Tiger and Bee. And not much art of music happens on a daily basis. In short, I decided to prioritize. I am one person homeschooling 5 children. I’m very outnumbered! I made the choice to not spend our entire day on school endeavors but have time for a break for me and playtime for them. This meant that a few items were removed from the schedule in order to simplify. For Ladybug, I keep our time short and easy. We only spend 30 minutes on school so she’s moving very slowly through her PreK plans. For Tiger and Bee I decided to focus more heavily on reading and math, pushing most of our spelling and writing plans aside. Curly’s focus is on her writing. This means that science, art, and music are often set aside. I have chosen to focus more heavily on learning languages, writing skills, grammar, and math this year. Next year we will have to ramp up our science plans which I plan to outsource through Landry Academy. Overall, our year was slightly simplified and all of our subjects fit nicely into our schedule which allows us to finish our school day by 2 PM. So, while I did over plan a little bit, I think I’m getting a little bit better in this regard. Or at least I’m more realistic when it comes to outlining each school year and making curriculum plans. I’m learning that sometimes simple is best. Short lessons can be the most effective at times. It doesn’t take 4 different curricula options to teach each subject. I don’t always need to supplement. I can’t possibly use every shiny new curricula on the market. At times it’s best to focus on what’s necessary and leave time for exploration and play. After reading this book by Sarah Makenzie, I realized that I needed to reevaluate our day, simplify, and homeschool from a state of rest and peace. I absolutely recommend this one! 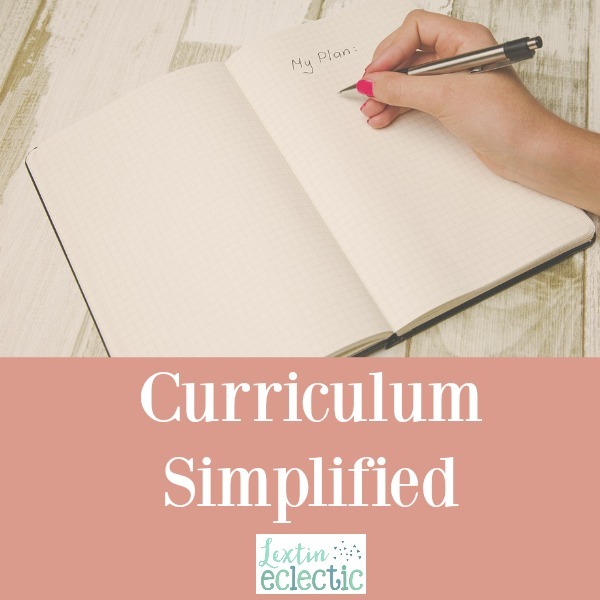 Do you need to take some time to carefully evaluate your homeschool and find areas that can be simplified?